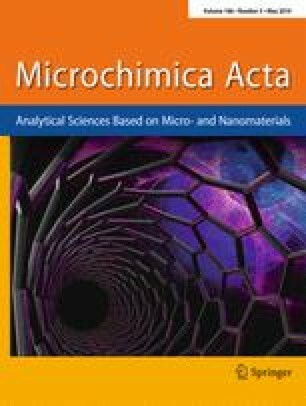 A potentiometric sensor for sialic acid (SA) was developed based on molecular imprinting technique. The sensor was fabricated by modifying carbon nanotubes (CNT) and an SA-imprinted poly(aniline boronic acid) (PABA) film on a glassy carbon electrode (GCE). 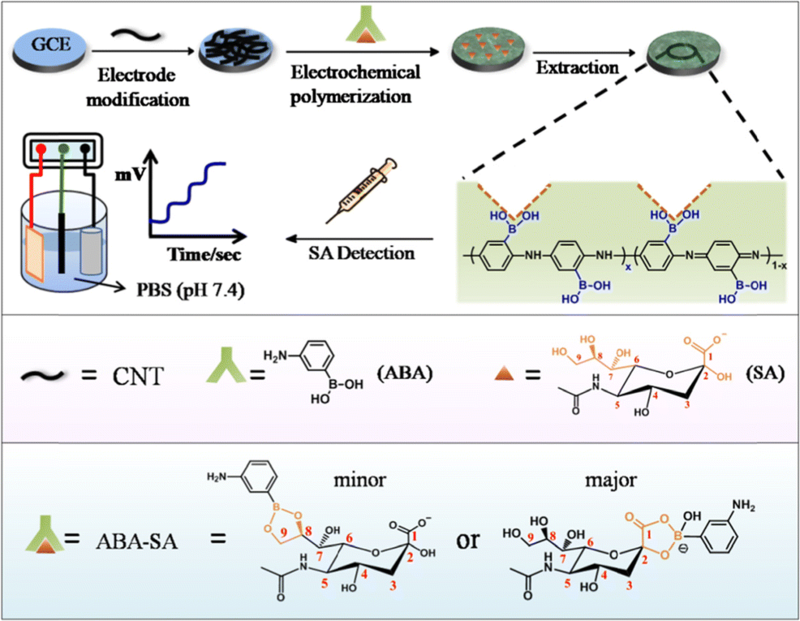 The detection strategy capitalizes on the change of electrochemical potential resulting from boronic acid-SA interaction. The imprinted PABA combines the functions of SA-binding boronic acid groups and the imprinting effect, thus endowing it with both chemical and sterical recognition capability. The imprint factor (IF, compared to a non-molecularly imprinted polymer) is 1.74. The sensor can well differentiate SA from its analogs at physiological pH values and has a linear potentiometric response (R2 = 0.998) in 80 μM to 8.2 mM SA concentrations range with a detection limit of 60 μM (at S/N = 3). The sensor was applied to the determination of SA in serum samples and gave recoveries between 93% and 105%. Schematic presentation of the fabrication of a sialic acid (SA) imprinted poly(aniline boronic acid) (PABA)/CNT modified electrode. The electrode can well differentiate SA from its analogs at physiological pH and determine SA in human serum samples with satisfactory recoveries of 93%–105%. The online version of this article ( https://doi.org/10.1007/s00604-019-3387-8) contains supplementary material, which is available to authorized users. The authors are grateful to the financial support by the National Natural Science Foundation of China (51503126 and 21534008) and the kind help of Ms. Fan Yang from Guanghan Chenglin Hospital.